Chukotka is located at the north-eastern tip of Russia and Eurasia. It is one of the most isolated places in the world. The small local population lives in little villages scattered over the vast tundra, which is full of blossoming and fragrance in summer and immersed in endless night, snow, ferocious Arctic winds and the mystic northern lights in winter. Chukotka is the most remote, inaccessible and inhospitable region of Russia. It is also the least explored. Living here, among the winds of two oceans, the unique flora and fauna and the mysterious monuments of Chukotka's ancient inhabitants one feels like a speck in the silent snowy wilderness. The Chukotka Autonomous Area is located at the north-eastern tip of Russia and Eurasia. With an area of 721,500 square kilometers it's larger than any European state, and it is the most sparsely populated region of Russia. 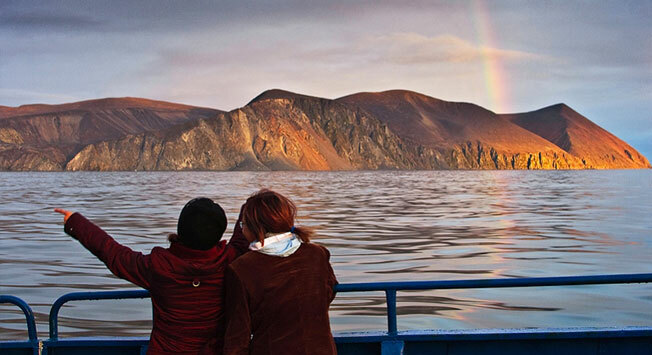 Chukotka has just 50,000 inhabitants, half of whom belong to the small Northern peoples. Chukotka is wedged between the Arctic and Pacific Oceans. From Cape Dezhnev (the easternmost tip of Russia), one can simultaneously see the Arctic, the Pacific, North America and the boundless tundra of Eurasia. Chukotka is also the only Russian region located in two hemispheres. The only other place on Earth where the 180th meridian passes on land is the Fiji Islands in the Pacific. Chukotka is tundra. Its vast hilly spaces are covered in moss, dwarf trees (tiny birch-trees, willows and other trees creeping along the ground) and grass. During the short summer Arctic berries, mushrooms and flowers make the tundra colorful and fragrant. After a period of rain and fog, the first snowfall starts in late October and continues till next June. Covered in Arctic night, Chukotka sees only a couple of hours of sunlight a day. Record winds can reach up to 288 kilometers an hour here and in winter, one can see the Northern lights here. Late June marks the coming of spring, when thousands of migrant birds fill the sky. The melting snow creates turns the tundra into an impassable soggy labyrinth. But spring here is short, Arctic summer returns in July or August. Chukotka may seems puzzling at first. For instance, all doors open inward. In nine-month-long winters, many houses are buried in snow. To leave home in the morning, people have to open the door inward and dig a tunnel through the snow. If doors opened outward, it would be impossible to get out. The indigenous population of Chukotka, the Chukchi and Eskimos, are cheerful, fun-loving folk. Every winter they have dog- and deer-sled races. In summer they hold the Beringia Festival where master craftsmen display their wares and folks from all over Chukotka compete in national sports. In summer one can glimpse the natives hunting whales. In a show of respect, the Chukchi cut a slice of whale to throw into the sea. In doing so they hope to help the whale heal and return. One of the most mysterious monuments of Arctic culture is Whale Bone Alley. It is located on the uninhabited Yttygran Island in the south-east of Chukotka. The alley is made of two 500-meter-long rows of Greenland-whale ribs and skulls. What is most astonishing is that the bones were brought there from other places. A road paved with stones leads from the alley to a round area with circles of stones and an ancient fire pit. Scientists think it was a shrine for ancient Eskimos. Modern Eskimos have great reverence for graves and the ruins of ancestral homes. Surprisingly there's no mention of Whale Bone Alley in local folklore. The Pegtymel Petroglyphs are another interesting artifact of ancient Eskimos. The 2,000-year-old drawings are etched on cliffs at a height of 20–30 meters.They depict scenes of hunting, as well as strange human-like creatures with mushroom-shaped heads. The strange shapes draw comparisons with the ancient Mayan pictures and link them with hallucinogenic mushrooms. Others attribute the drawings to contact with extraterrestrial life.